Seriya is a Byron Bay Yogini whose exposure to her mother’s Yoga and Healing life has left strong and lasting impressions on her very being. Her personal journey has guided Seriya to practicing and studying Meditation & Healing throughout Asia, the Middle East, Europe, Central and North America. All of these life experiences have expanded her knowledge and understanding while at the same time deepening her intuitive relationship with her Self, her planetary community and the Divine. Seriya is certified in both Daoist Yin Yoga and traditional Sivananda Hatha Yoga and has also trained in the Hawaiian tradition of Kahuna Bodywork and the path of Shamanism for many years. In addition she is a certified Remedial Massage Therapist, Liquid Crystal Practitioner, Energetic Healer, Soul Retrieval Therapist, Sound Therapist and passionate Kirtan singer (devotional chanting) and instrumentalist. In all of her life’s work Seriya very consciously holds sacred space for her clients and participants with the centred intent to deeply respect, support, nurture and inspire their own healing and Self-growth. Seriya was the Experiences Coordinator for 6 years at The Crystal Castle, Mullumbimby. In this role she trained, managed and led numerous facilitators while also developing and facilitating large workshops on Meditation,Yoga, Nature, Crystals and Sound Healing. The regular implementation of the multitude of skills related to creating and facilitating workshops for all walks of life further supported Seriya’s personal and professional development. 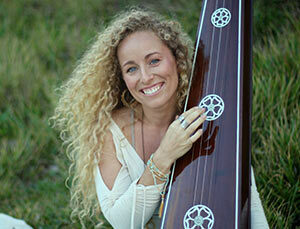 Seriya also regularly holds her own women’s healing events in Byron Bay as well as international Yoga/Adventure retreats. Her tertiary background in Theatre, Music and Teaching has given Seriya a solid foundation to be skilled, relaxed and confident in group facilitation. She has led large groups of up to 1800 people at festivals such as Evolve, Starlight, Splendour in the Grass, First Sun NYD Lighthouse and Spirit Fest. Seriya also travels widely, offering her workshops and private Intuitive Healing sessions at yoga studios throughout Australia. She shares everything from a place of authenticity, combining her extensive practical knowledge with healing, humility, spontaneity, compassion and lightheartedness. Matty Rainbow is a Byron Bay based, certified Kinesiologist, Sound Healer and Meditation facilitator who is always enthusiastically exploring new ways to deepen his knowledge, spiritual guidance and self-awareness. He is also an experienced Reiki Master, is fully certified in Advanced Liquid Crystals and has intensively studied the ancient art of Polynesian Bodywork, Kahuna. Matty has regularly facilitated large Crystal and Sound Healing workshops at The Crystal Castle, co-facilitated the ‘First Sun’ New Year’s Day event in Byron (1800+ people) and been a guest speaker at The National Kinesiologist Conference 2016. In addition Matty also immerses himself in Men’s Work, facilitates Men’s Empowerment Circles and has organised and presented numerous monthly Sound Healing events at the full moon rising in Miami. By combining his multitude of healing skills and wide-ranging practical experience, Matty consistently and confidently commits to deeply supporting his wide range of clients and participants. His mission is to enhance, activate and inspire physical, emotional, mental and spiritual healing. Matty is particularly passionate about sound and vibration and works with each of these elements to create a very gentle and relaxing, yet subtly profound and powerful, healing experience for his clients. On a personal level Matty Rainbow is always exploring his conscious Self as a father, partner, surfer and lover of nature. Living an active, light-hearted and high-energy lifestyle you will often find him either creating something in the backyard or running up a mountain.